"We aim at structuring materials down to the atomic level or to dimensions specific to the envisioned experiment." 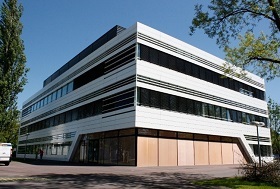 The Walter Schottky institute of the TUM operates the Center for Nanotechnologies and Nanomaterials (ZNN), as a shared nanofabrication facility. 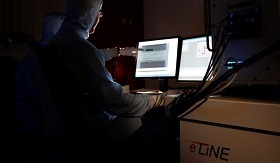 Students, researchers, and scholars from the greater scientific Munich area have access to state-of-the-art nanolithography and -analytic instruments for building and characterizing nanoscale electronic, optoelectronic, and photonic circuits. The nanofabrication methodologies include ebeam-, focused-ion-beam-, and helium-ion-lithography. To keep the investigated nanoscale materials and circuits clean from micron-sized particles, all of us need to wear specific gowns in the clean room. The so-called ‘optical lithography’ utilizes light in the ultraviolet such that the clean room needs to be lightened in yellow. 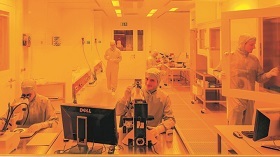 Our cleanroom is in general certified as class 4 and in some areas class 0. 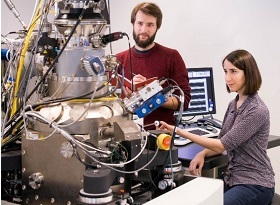 The helium ion microscope (HIM) allows structuring nanoscale materials on a lengthscale of sub-10 nm or even down to the single defect level. The HIM-lithography particularly works for atomistically thin materials, such as 2D materials, and semiconductor nanowires. The focused ion beam (FIB) lithography typically utilizes Ga+-ions to locally sputter materials such as metals into nanoscale circuits. Moreover, we take the FIB to fabricate thin lamellas of solids as investigated in transmission electron microscopy. 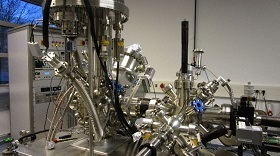 Atomic layer deposition (ALD) is a thin-film deposition technique based on the sequential use of a gas phase chemical process. 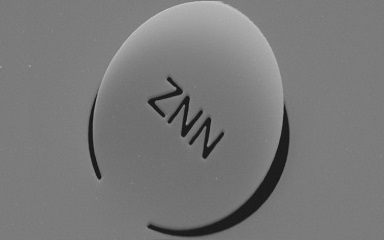 We use the technique to fabricate thin dielectric and metallic layers for instance for catalytic systems. 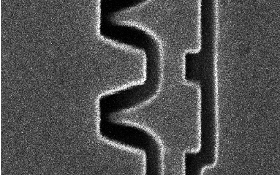 The optical lithography is our work horse for defining circuits on a sub-micron structure size but with macroscopic extensions. 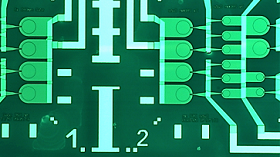 The optical lithography allows depositing complex circuits made from thin metal layers on top of various substrates. The atomic force microscope (AFM) allows characterizing the surface of nanoscale materials with a resolution close to the atomic limit. 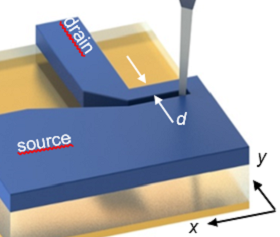 We further use our AFM to structure thin materials into local circuits with source and drain contacts by a 'ploughing technique'. The ultraviolet and x-ray photoelectron spectroscopy (UPS & XPS) rely on the photoemission of electrons from thin surface layers and allow characterizing their elemental composition. We analyze nanoscale materials promising for energy conversion applications. The electron beam-lithography is the standard method to define plasmonic structures down to the few nanometer scale. 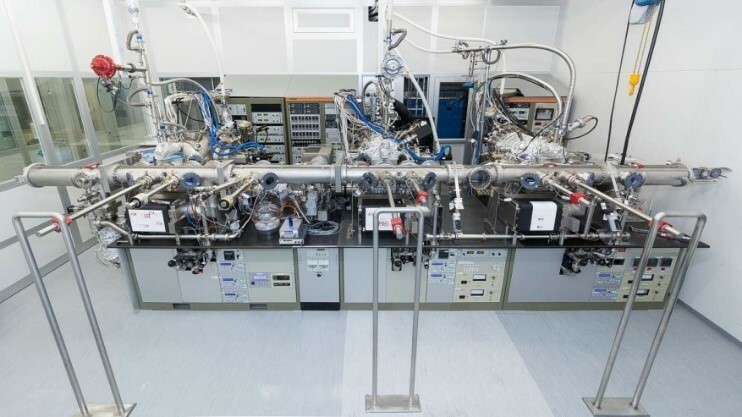 ... including a wide range of III-V seminconductors (group III Arsenides, Phosphides, Antimonides, Nitrides) and atomically thin nanomaterials (graphene and transition metal dichalcogenides).